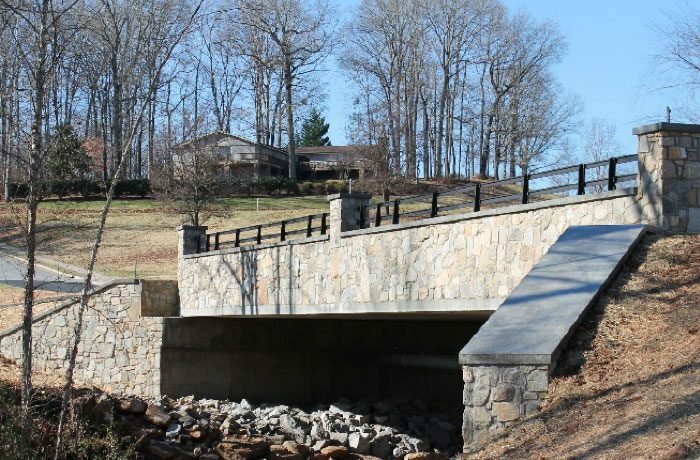 This project in the Rock Barn Country Club community located in North Carolina included the design of a new bridge that would span Lyle Creek. In July 2013, torrential rainfall caused the failure of the existing Ridge Drive NE bridge by scouring under the center pier. Following hydraulic and structural analysis, a new 90’ long by 44’ wide vehicular bridge was designed and installed to NCDOT standards. Additionally, the design of this residential bridge was given special consideration that included aesthetic enhancements, stone work and special rails to match the character of the community. TGS provided these services as a subconsultant.